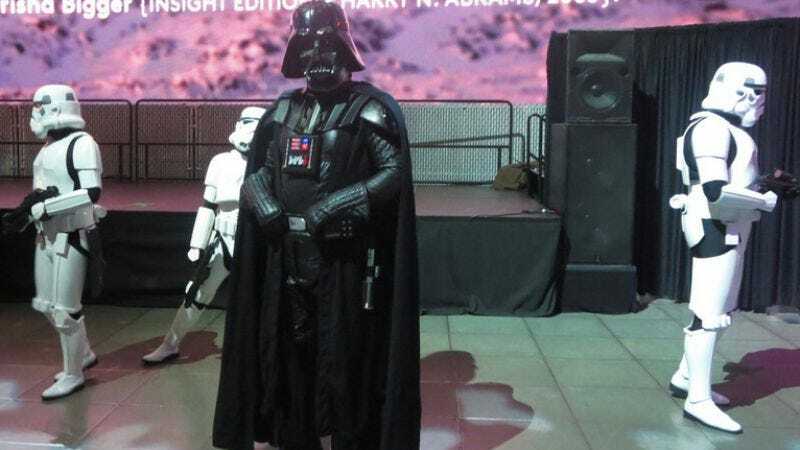 Attendees are encouraged to wear costumes of their own—not that Star Wars fans need much encouragement. Tonight there are numerous would-be Jedi warriors being trained in the fine art of how to thrust a lightsaber. There’s a number of Princess Leias, with Microsoft employee Beth Fitzgibbons’ ensemble being especially creative: She’s the hologram version of Leia, in the message that pint-sized droid R2-D2 plays at the beginning of A New Hope. There are a few Stormtroopers, some encased in hard white plastic outfits, others opting for more comfortable, if less aesthetically pleasing, cloth outfits made to look like hard plastic. There’s even an elaborately costumed Queen Amidala. But Anthony Daniels—much to his relief—is without his signature costume. The actor who’s been stuffed inside C-3PO for all six Star Wars films (and who will continue to endure being placed in what he calls “the most uncomfortable costume in cinematic history” in the three upcoming Star Wars epics) wears a dapper black suit this evening, a gold tie the sole reference to the character who’s been the dominating presence of his career. Though Daniels jokingly tells me that looking at C-3PO’s costume provokes “dread, nightmare, horror!” he also admits to having a more nuanced relationship with his alter ego. “I use that structure as a tool—as a costume, it’s something I wear. But I’m not him, and he’s not me, and the costume isn’t without me to animate it, shall we say. So it’s quite a curious relationship. It’s not a very easy role to play, physically. But my fondness for the character makes me put up with it. We’ve been together for 40 years or so—if I didn’t like him I wouldn’t put up with him, would I? The exhibit ostensibly celebrates the artistry of those signature Star Wars outfits. But at its heart, it’s really about the broader phenomenon of Star Wars itself. When the first Star Wars film was released, the studio, 20th Century Fox, had so little faith in the project that it allowed director-writer George Lucas to keep the merchandising rights, and Lucas himself wasn’t certain of the film’s success. But the sci-fi/fairy tale mash-up took the country, and then the world, by storm. It was the first multi-generational blockbuster of the era, the kind of film that makes fans get misty-eyed as they recall first seeing it. One such fan, Terry, is carrying a picture of himself and a group of friends taken in front of the Briggsmore Theatre in Modesto, California, where they first saw the film (and where, he notes, Lucas premiered American Graffiti). It later appeared in the school yearbook. “I love that it’s in color!” Terry enthuses. Fans didn’t just return to the theater to see the film numerous times. They also bought stuff. Star Wars-emblazoned posters, T-shirts, lunch boxes, action figures, and other collectables flew off the shelves. The proceeds made Lucas a millionaire, and allowed him to leave directing behind in favor of executive producing, along with developing sound and effects companies like Industrial Light & Magic; after the original Star Wars, he wouldn’t direct another film until 1999’s Star Wars Episode I: The Phantom Menace. Some of that is generational; those who saw the original trilogy on its first release are far more dubious about any merits the prequels have to offer. And preferences aside, there’s certainly a difference in style and tone between the original and prequel trilogies. The prequels are darker, somber, and everyone’s so serious and moody (except for the much maligned Jar Jar Binks; perhaps not coincidentally, none of his costumes are in the exhibit). The originals (especially A New Hope) have a fresh-faced, wholesome quality that bordered on parody. Even at the time of their release the films felt nostalgic, a look back at a kinder, gentler era, especially in contrast to the cold, clinical perfection of the prequels. That difference is apparent in the costumes on display. The ones from the original trilogy are more basic, without much in the way of embellishment. Part of that was for budgetary reasons; A New Hope had little money to work with, so the characters wore the same outfit throughout the entire movie. But those outfits served them well; even before they speak, you know exactly who they are by what they’re wearing. Luke, in his white tunic, is clearly the aspiring young hero; Obi-Wan Kenobi wears the brown, hooded robe of the wise old man; Darth Vader, clothed head to toe in black, is the ultimate bad guy. Access to more money didn’t necessarily bring about a better result; the CGI-created drone armies of the prequels don’t have any of the impact of the sinister in-the-flesh Stormtroopers of the original trilogy. But no one tonight seems too concerned about narrative threads, as they fit in a gallery visit in between Q&As with Daniels and Billy Dee Williams (Lando Calrissian in Empire Strikes Back and Return Of The Jedi), watch lightsaber duels, and cheer for their favorites in the costume contest (Vonoy’s Queen Amidala wins). The fans revel in the Star Wars world, and there’s no downside; even the original trilogy versus prequel trilogy debates help keep the franchise going—and everyone’s planning on seeing the next film in the saga, The Force Awakens. In short, you can’t escape Star Wars. Even if you’ve never seen one of the films. “Star Wars is so permeated in our culture,” says Lisa Loop. “Lines from Star Wars—like ‘may the Force be with you’—it’s just such a part of Americana. And so to actually get to not quite touch, but to see and be close to some of it at this exhibit is such a thrill. And now we’re reliving excitement of it through Ava’s eyes.” And the Force shall continue. “Rebel, Jedi, Princess, Queen: Stars Wars And The Power Of Costume” will be on display at the Experience Music Project through October 4, 2015. It will then go on a national tour.